The logo and the title of any design, whether a website or a poster for a company, is very important, and if we can't pay a professional design, it is always possible to create our own one by means of a tool like DDTitle. 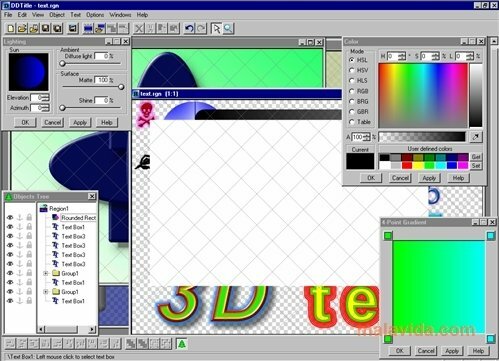 This software is specially designed to create titles and logos, thanks to which, this process will be very simple due to the enormous possibilities that it offers. With DDTitle we'll have tools to create simple geometric figures (ovals, lines and rectangles), as well as a color palette, and the possibility to import geometric and vectorial collections to add to its vast library of styles and forms. Of course, it's possible to generate texts with effects, like giving them volume or changing their shape as we deem convenient. Once we finish, DDTitle allows us to save the resulting file in TGA, PNG (with or without transparency), BMP or JPEG format, maximizing the compatibility. 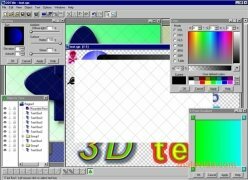 The program's interface is very simple, similar to that of any moderately advanced image editor, we'll have a windows with all our creations open and several floating windows with the options and tools that are necessary, like colors, illumination or selection tools. This download requires a ZIP compatible compressor. In the trial version there's a square on the images created.